When I was growing up, my favorite thing was to run to the corn field that was behind my godmother's house, take a blanket, put the blanket on the top of the tall corn stalks and make a pretend house. My friends and I would then bring plastic bottles and cups, snacks, dolls, trucks and more blankets and pillows and spend a day playing house. Well, we don't have a field behind our house and unfortunately even our deck is at the sad state of repair at the moment, so I thought I'll re-create the atmosphere in the park and instead of blankets-over-corn I'll make a teepee for LoLo's birthday. 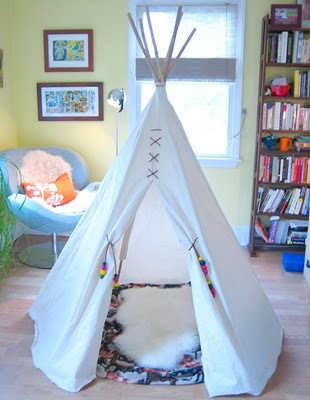 After many searches, I finally found a page with Teepee I loved and instructions that even I could follow :) HERE. The fabric came from Ikea. I bought 5 yards of the story print a bit more, just to be sure. And 2 yards of the gingham red and white kind. Now, I know this is a tutorial but can I just tell you also the story behind fabric shopping at Ikea? Well, firstly .. Why isn't there anybody EVER at the fabric counter? I first bought only a yard of the gingham, but realized I will need more so we had to make another run to the store. I finally see a girl wondering around .. ask her for fabric and she tells me "Oh, you can just cut it yourself!" What?? Really??? She then moves in a tempo of a snail on a leisure stroll towards the counter. I ask for two yards of the red and white. She cuts a yard and proceeds to measure the other yard. "What are you doing?" I ask politely ... she looks at me with wide surprised face and eyes "Why?? You want two yards together???" Uhmmmm .... "That would have been preferable, but OK, I'll take a yard only" ... Now came the most challenging part of this exchange! "Can I have a yard and a half of this fabric, please??" I didn't make a pattern just cut the pieces straight out of the fabric according to the photos above. 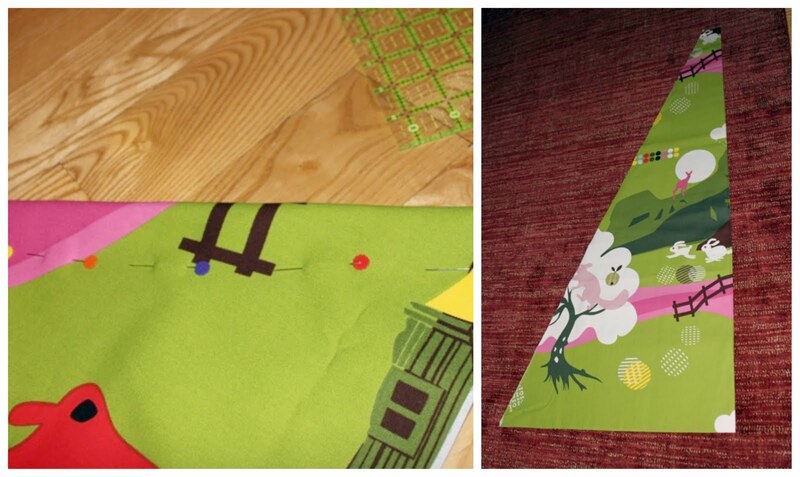 This is how I cut: I folded the fabric diagonally on the line, pinned and cut. I love the little story left to interpretation on it with the fox, the bunnies, the squirrel and the house. I also made a tie out of the gingham fabric instead of using a rope. The "doorway" is also different from the one on the other blog - mostly because I forgot to cross the two sides, so that it would cover the entrance, but also because I just think the checkers down the middle make it all come together. So, that's my design ladies and gents! 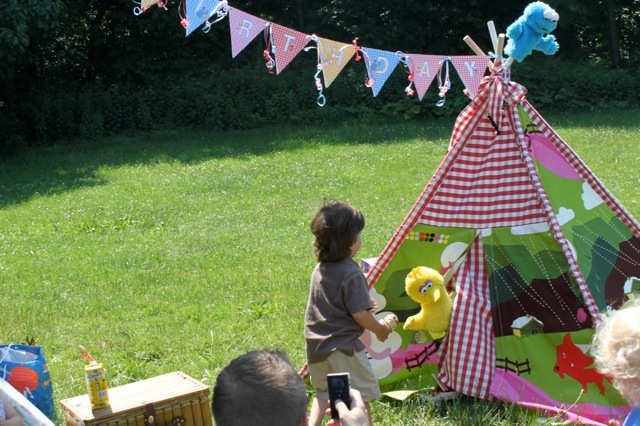 A teepee is also great for a puppet show! 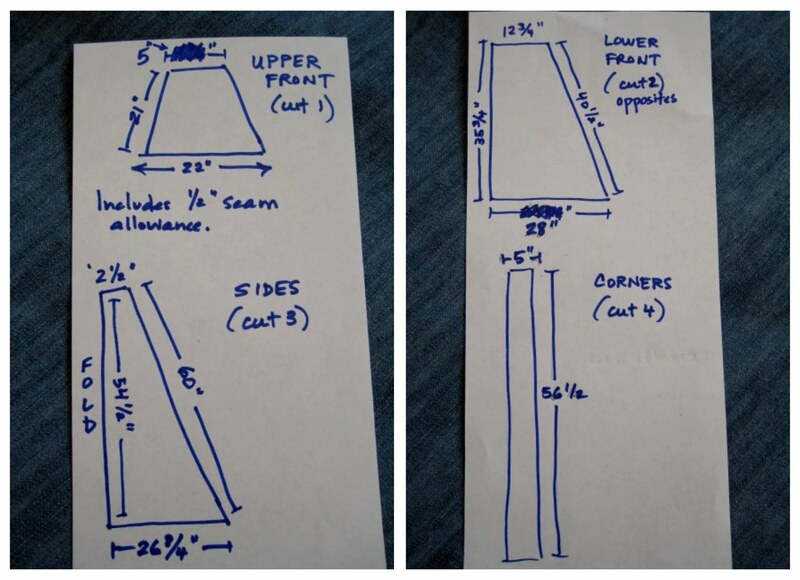 Don't be intimidated by this project, I promise it's much easier than what it seems like! And if you absolutely need a pattern, I found one on Amazon HERE for 8.98 USD. 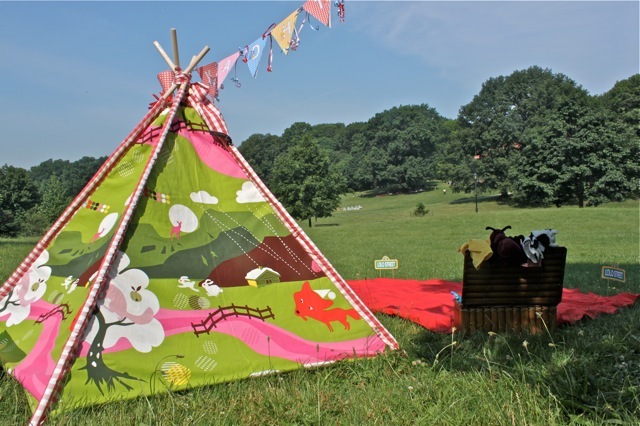 Happy hiding in your Teepees! I love IKEA fabric, but never had a good experience getting it cut either! love it. 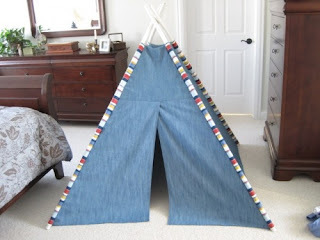 i've been wanting to make a teepee for months now, but have run into the same problem with the sticks. your solution is perfect! and i'm always trying to think of a project for the large scale ikea prints. but getting fabric cut there is never easy! found you on the crafty round up at the long thread! 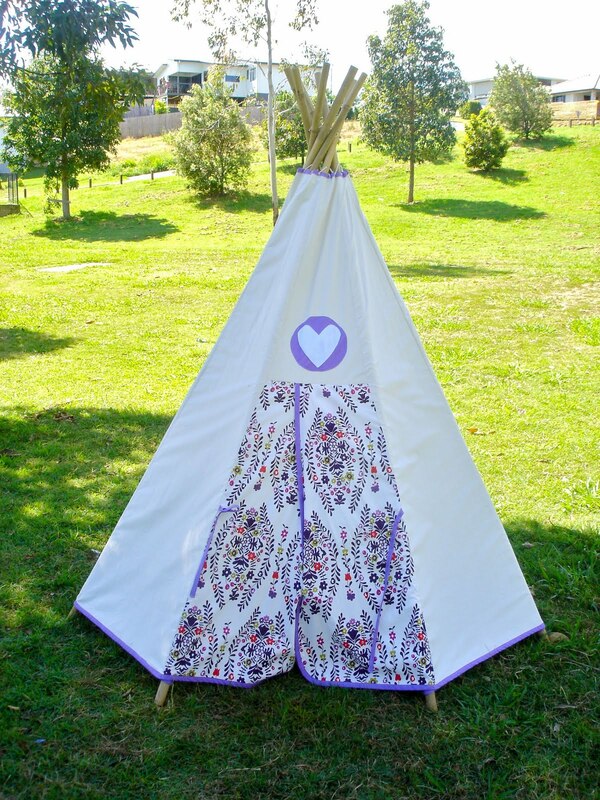 Love your teepee, that fabric looks like it was meant to be a teepee! Also loved your IKEA story!! I've had mixed success there too! Great job! 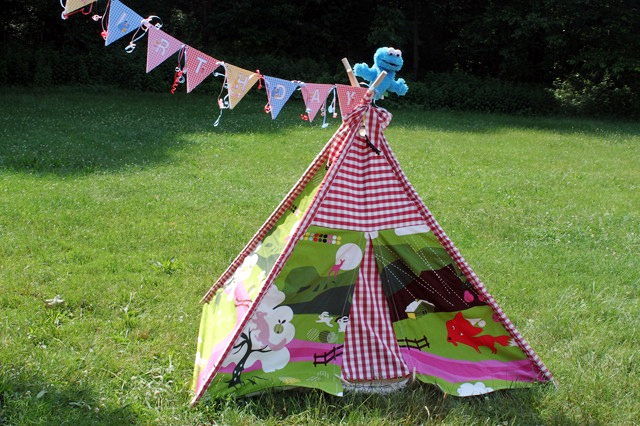 oh.my.goodness...saw this awesomeness on ohdeedoh, what a super wonderful idea! looks like such fun, nice job Mama!! 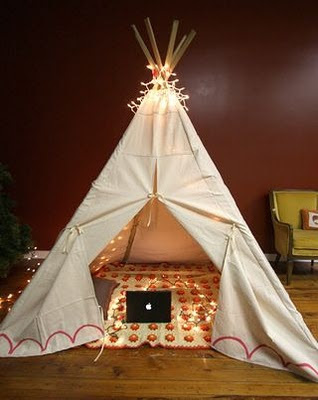 This teepee is so cute - I love it!! I, too, have been wanting to make one for ages. Was a bit intimidated by the idea, but your post gave me the get-up-and-go I needed. Just finished it for my boys for Christmas. Can't wait for them to see it! Thanks a million!! Could you tell me what this project cost you? Erika, after the fabric is bought you only need the poles and they are not much. I would recommend buying plastic plumber pipes though instead of wood (just lighter to carry if you are going to the park like we do). Maybe 20 - 30 USD? Good luck with your project! Thank you! Hm good question .. not too wide. I am not sure about the exact measurements when open, but one adult can fit inside sitting ... It's ok for two toddlers to hide out but it's definitely not a place for an adult to hang out ..